The term dongba (Nakhi: ²dto¹mba, Chinese: 东巴; pinyin: dōngbā; literally: "Ba of the East") refers to priests of the Nakhi people of Southwest China, who are masters of traditional culture, literature and Dongba symbols. 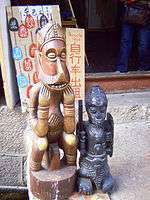 The dongba are Bon priests. They play a major role in Nakhi culture and preach harmony between man and nature. Their costumes show strong Tibetan influence, and pictures of Bön gods can be seen on their headgear. Tibetan prayer flags and Taoist offerings can be seen in their rituals. Religious rituals are also conducted by the priests to propitiate the spirits, as they were believed to be living in every part of the natural world. The core of the Dongba religion is based on the belief that both man and nature are two half-brothers born of two mothers and the same father. This creates revenge from heaven, which befalls upon humans who use up too much natural resources. A complete annotated translation of ancient Nakhi Dongba Books (traditional Chinese: 纳西东巴古籍译注全集), in 100 volumes, has been published. XU Duoduo. (2015). A Comparison of the Twenty-Eight Lunar Mansions Between Dabaism and Dongbaism. «Archaeoastronomy and Ancient Technologies», 3 (2015) 2: 61-81 (links: 1. academia.edu; 2. Archaeoastronomy and Ancient Technologies). Wikimedia Commons has media related to Dongbaism in China. ↑ webmaster. "杨一奔委员：建议抢救性翻译《东巴经》 – 中国民族宗教网". mzb.com.cn. Edongba – Input Dongba hieroglyphs and Geba symbols.